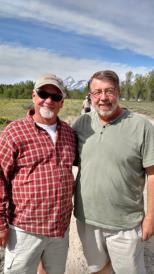 While photographing last year outside of Jackson Hole, Wyoming, near the famous Pilgram Creek Road, I had the privilege of meeting in person, world renowned Nature & Wildlife Photographer, Thomas Mangelsen. The Pilgram Creek Rd location was where Mangelsen extensively photographed, Bear 399 and her cubs. Tom's work has always been an inspiration to me as I've traveled photographing. Thanks for the encouragement you gave, as well as our picture together.